Godzilla/Gojira was born out of nuclear anxiety in the post-Hiroshima 1950s, so a reboot makes perfect sense in the angsty post-Fukushima teens. Apparently enough time has passed in the five years since the tsunami and nuclear emergency to destroy Tokyo again, but the echoes of the real tragedy conspicuously reverberate in the King of Monsters’ latest outing. Fittingly, the creator of the Evangelion franchise and the special effects director of the more serious 1990s Gamera reboot trilogy explore those apocalyptic themes in Hideaki Anno & (co-director) Shinji Higushi’s Shin Godzilla (trailer here), a real deal Toho-produced Japanese-language Godzilla movie, which opens this coming Tuesday for a special week-long run in select cities. A large mutating lizard is heading straight for Yokohama, but if the Prime Minister’s cabinet is going to address the issue, someone will have to make a motion to set aside the agenda. Bureaucracy is sluggish, myopic, and turf-conscious throughout this Godzilla film, giving the scaly creature a further advantage he does not need. From early sightings through his initial landfall, they consistently underestimate the King. However, at least one sub-cabinet appointee, earnest but rather tactless Rando Yaguchi, recognizes the danger (how could he miss it?). It turns out at least one prominent government scientist had an inkling of what was to come, but he chose to end it all rather than stick around to witness the carnage. When the government finally realizes they have a situation on their hands, they authorize the self-defense force to throw the kitchen sink at Godzilla, but they only succeed in drawing a little blood. Of course, this enrages the stomping kaiju no end, so he turns himself into a veritable disco ball of death rays. He proceeds to wreak some incredible havoc, even incinerating the Prime Minister’s evacuation helicopter. However, he will have to hibernate for two weeks to restore his energy. That gives Yaguchi and his team of government misfits and rebels a narrow window to develop a strategy to freeze Godzilla by targeting his unique circulatory system, before the Yanks nuke him with the UN’s blessing. Fortunately, he has the backing of U.S. Special Envoy and prospective presidential candidate Kayoko Ann Patterson, who will also remain in harm’s way with the ragtag group of scientists and emergency management specialists. Shin Godzilla harkens back to the moodiness original, unadulterated 1954 Godzilla, but it shows the monster almost immediately and subsequently never leaves him out of the frame for very long. However, kaiju fans might be put off by the film’s 1970s docu-drama tone. Screenwriter Anno is almost perversely obsessed with meeting rooms, following the various cabinet and sub-cabinet officials as they convene and re-convene around sundry conference table’s throughout the PM’s residence. Clearly, the politicians and bureaucrats are preoccupied with procedure and minutes, very much to the detriment of public safety. Rather annoyingly, there is also a pronounced strain of anti-Americanism in this film (what would Raymond Burr’s Steve Martin say? ), but at least we can support the idea of a Pres. Kayoko Patterson, especially in a year like this. While not exactly Yes, Minister, Shin Godzilla is surprisingly sly when skewering bureaucracy and the political class. However, it still has room for idealism, especially with respects to the jaded and ambitious Yaguchi and Patterson, who risk everything to save Tokyo and perhaps the very soul of Japan. Hiroki Hasegawa and Satomi Ishihara forge some terrific chemistry together—especially since Anno and Higuchi force them to do it on the run. They just don’t have any time for backstory, so all character development (and there is some) emerges organically from within the on-screen crises. And then there is Godzilla. Mostly computer generated, he looks terrific from a distance and when engaged cataclysmic destruction. 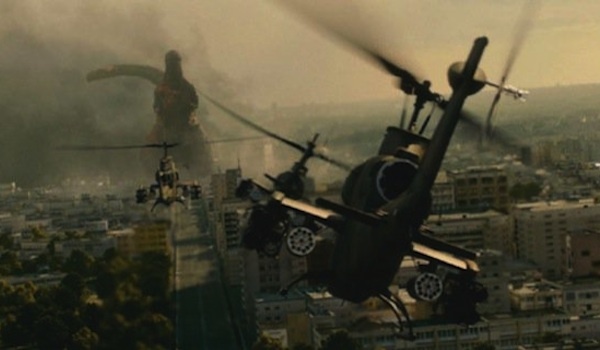 To borrow a technical film studies term, when Godzilla gets Medieval on Tokyo, it is just plain awesome. However, during his close-ups, the King still looks a little “fake.” Yet, this is not necessarily a mistake. In fact, it feels like a fitting way to observe tradition. To the great credit of Anno & Higuchi, Shin Godzilla is a surprisingly tight, tense, and pointed disaster movie, as well as jolly fun kaiju romp. One can very easily see echoes of Fukushima and Katrina in scenes that remind us how helpless mankind is in the face of apocalyptic natural disasters (obviously defined quite broadly). This is the first eagerly anticipated blockbuster that lives up to its hype since Ip Man 3, so good luck following in its wake, Rogue One. 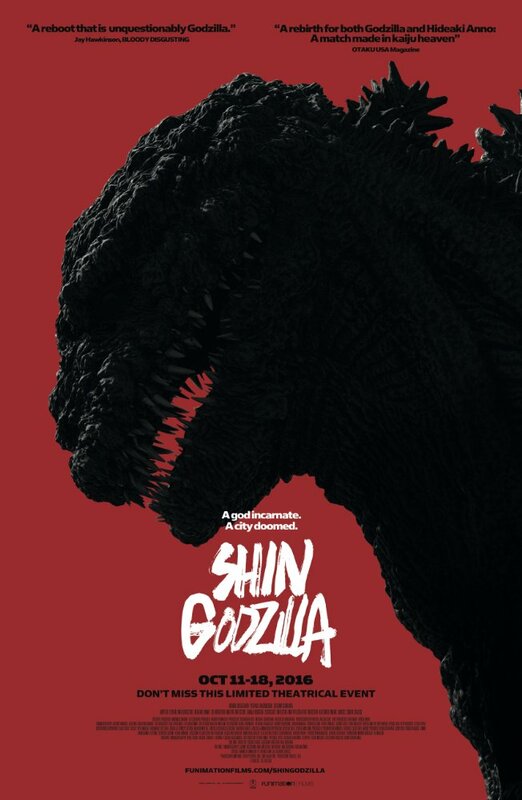 Very highly recommended, Shin Godzilla screens Tuesday (10/11) through Tuesday (10/18) at theaters nationwide, including the AMC Empire in New York.